The era of talking pictures arrived while Alfred Hitchcock was working on his crime thriller, Blackmail, in 1929. The film had already been shot as a silent feature but during post-production the studio asked the director to convert it to partial sound so it could be marketed as a talking picture. Hitchcock, as was his way, had his own ideas. He began to tinker; scenes were reshot with dialogue, additional scenes with dialogue were added. In the end, Hitchcock had two films - his and Britain's much touted "first full length all talkie film" - and the original silent version. 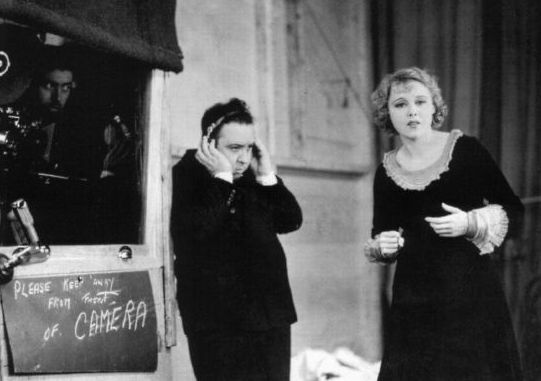 In 1929, most theaters in Britain were not equipped for sound, so it was the silent Blackmail that was for a long time the most widely seen and popular of the two films. One night last summer, the California Film Institute presented a special screening of a 35 mm British Film Institute archive print of the silent version of Blackmail at a theater near me. Accompanying the film with an original score was the Alloy Orchestra, one of the world's foremost silent film orchestras. In attendance was an enthusiastic sold-out crowd. Blackmail was Hitchcock's second film of the thriller genre; the first wasThe Lodger (1927), the picture that first brought him widespread acclaim. 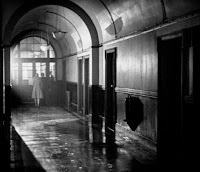 Blackmail, a film that critic and Hitchcock author/scholar David Sterritt declared "has a strong claim to being his first masterpiece," foreshadows Hitchcock's later work in many ways. Visually sophisticated and gimlet-eyed in its observation of human nature and motives, it includes a delicately lovely woman in grave danger (who spends much of the film as if in a daze) and a grisly murder; the climactic chase scene at a landmark, the British Museum, is the first of such Hitchcock signature set-pieces...and there is no shortage of moral ambiguity. The story, which Hitchcock conceived as a conflict between love and duty, centers on a middle-class young Londoner, Alice White. Alice lives with her parents, helps out at their tobacconist's shop and is dating a straight-arrow Scotland Yard detective. After the pair has a spat over dinner, she recklessly goes off with an artist/Casanova and ends up involved in a killing (see clip below); as a result her beau is drawn into the investigation - and a blackmail plot. Blackmail stars Anny Ondra as Alice, John Longden as her detective boyfriend, Cyril Ritchard as the artist and Donald Calthrop as Tracy, the not-so-innocent innocent man. The plot is well constructed, the action is tight and Hitchcock's mastery of suspense is evident throughout. Though clever and fast-paced, Blackmail is a film of some depth and darkness. Ultimately, the integrity of both central characters is permanently compromised. Though a messy situation is conveniently resolved, the truth comes out between the girl and her man and the film's ending implies an uncertain and possibly bleak future for the two who now share a terrible knowledge and guilt. The Alloy Orchestra artfully accented this screening of Blackmail, adding dimension and a sense of immediacy to the experience. However...the group is not exactly an "orchestra" but three musicians whose instruments include keyboards, accordion, clarinet, musical saw and a famous "rack of junk." 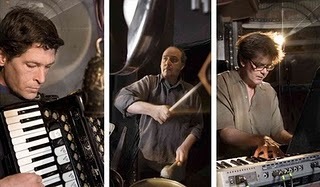 A combination of percussion and electronics allows them to create an array of sounds and effects. The Alloy Orchestra has performed worldwide - for major film festivals, AMPAS and even at the Louvre. I had not seen the sound version of Blackmail when I viewed the silent, but have since. I was a little surprised to discover that I much preferred the silent version. There are, perhaps, some technical reasons for this (rudimentary sound, the awkwardness of English actress Joan Barry voicing Czech-born star Anny Ondra's lines as Ondra performed). What struck me, though, was that the plot was rendered less ambiguous by the addition of spoken dialogue that was more explicit than the intertitles had been. Watching a silent film on the big screen with live music is always such a treat. Hitchcock's silent catalog is a weak spot in my viewing. Will have to check it out. Off topic a bit but last night I saw TAXI DRIVER at a local AMC theater. One of my favorite Scorsese films. I don't know what's with me, Eve, but as I just told Gypsy in my coment to her Manhatta post, I've been a laggard in visiting these two of my favorite sites -- mea culpa! I have not seen Blackmail, but I completely understand why you preferred the silent version, particularly becaused of the impact dialogue had on the movie. However, the orchestra experience sounds like something you enjoyed. This reminds me actually of a negative reaction I experienced when music was added a few years ago to the original Dracula with Bela Lugosi. It changed the whole atmosphere of the film, and I just hated it! I am such a Hitchcock fan, I don't know why I have never seen any of his silent films. I know I would like Blackmail from your description, and I would also like the Lodger, partly because I love stories about Jack the Ripper (hmmm...I wonder what that says about me! Great article, Eve - now I have to track down those movies. I am ashamed to say I have never seen an Alfred Hitchcock silent movie - I will definitely try to track this movie down. Excellent article! I'd seen "The Lodger," but the big screen with live orchestra experience is another thing entirely. Last year I also saw Hitchcock's "North by North West" in a theater and what a thrill ride that was. Not to mention the enormity of Cary Grant's screen presence/charisma. But back to "Blackmail"...it's very compact, fast-moving and suspenseful...a harbinger of what was to come from Hitchcock. I recommend it and hope each of you has a chance to see it. I went to a similar event last autumn when Blackmail was screened at the Barbican Centre in London. The BBC Symphony provided the accompaniment to Neil Brand's score. It was probably the best big screen classic film viewing experience I've had thus far. Kendra's mention of Neil Brand reminded me to add that the clip included here of the murder scene from "Blackmail" features his score. I think that I have seen three versions of BLACKMAIL....netflix has an odd silent with music...I agree about the superiority of the silent...the dialogue seems like an afterthought...p.s. I really dislike THE LODGER...sorry!! great post as usual!! Eve, it's great that you had the rare treat of watching Hitchcock's silent BLACKMAIL with a live orchestra! I've seen the sound version of BLACKMAIL and thought it was an impressive hint of even greater things to come from Hitchcock. My husband Vinnie and I will never forget the effective chant-like use of the word "knife" tormenting Anny Ondra. Great post, Eve! I haven't seen this one, but I think it was self-defense, not murder. The clip you included is riveting. You can see Hitch in every move. You can almost hear him directing, "Now turn slowly, slowly...put the knife on the table. Now you feel a chill." And the framing of every scene is classic Hitchcock. The shot straight down the stairwell, the end of your clip with the shadow, and the still of the finis you also posted. Perfect! I have to say that the soundtrack for the silent "Blackmail" clip I included with my post doesn't compare, in my opinion, to the live accompaniment I heard. Some have criticized the Alloy Orchestra for modernity, I disagree, but one definitely does not get that "nickelodeon" feeling from their "Blackmail" score. This is really a fine film, better than "The Lodger," I think...& more sophisticated than one might expect from Hitchcock at that stage. He is known as a masterful "visual storyteller" - it's clear he learned very well how to tell a tale without dialogue (or relying on an abundance of intertitles) during the silent era. Eve, I have not yet seen the silent film, "Blackmail". In this the movie clip you really can see from the camera angles and scenery, everything we would expect in a Hitchcock movie. I can not imagine how great this would be on the "Big Screen". Your wonderful post, has inspired me to learn more about Hicthcock's "silent films".